Are you looking for the best camping towel? Camping could be such a dirty business. Therefore, choosing the appropriate gear to bring along with you allows you to keep your focus on the adventure, rather than the mess. In fact, several camping tasks can be made a lot easier on your part if you have the right camping towel. Choosing the best camping towel may seem like an easy task. However, with so many brands and products to choose from, it can get very challenging. In this post, we will be discussing the everything you need to know about choosing the best camping towel on the market now. We do hope that by the end of this post, you will be able to make a wise buying decision. 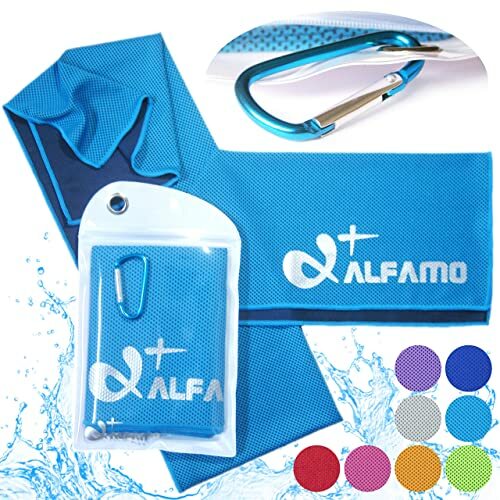 This camping towel created by Alfamo is specifically designed to cool you off when it is too hot. This quality alone makes it very ideal for outdoor adventures including cycling, hiking, working out, as well as camping. If you live in a tropical region, then you might want to consider this camping towel. In fact, you can also use this as a wristband, a scarf, or a neck wrap. This camping towel is made of breathable mesh fabric, designed to maximize its evaporative cooling effect. This material, if you are not familiar, is absorbent and can hold a lot of water. Once the water evaporates, then the towel cools down. Not only it promotes comfort, but also prevents hot flashes or overheating. If you want a unique camping towel that has cooling capabilities, then you might want to choose this towel by Alfamo. If large coverage is what you are after, then you should consider getting this camping towel by Dock & Bay. While it is technically not marketed as a camping towel, it has all the qualities you are looking for in a good camping towel – relatively compact and lightweight. It is made of super soft polyester blend microfiber, making it ideal to bring along with on your camping trip. 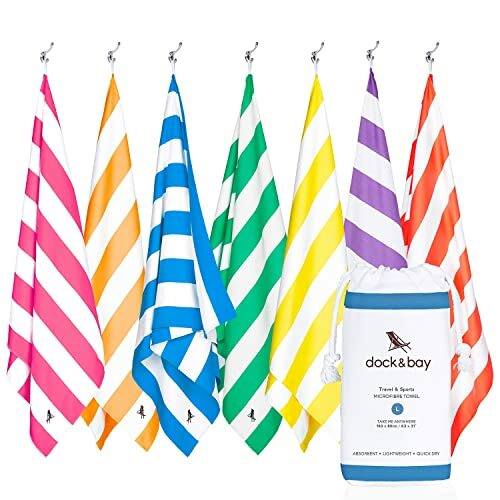 This towel by Dock & Bay comes in three sizes: large, extra-large, and round. Its microfiber material is highly absorbent and is very smooth to touch. It comes with a fixed elastic loop you will find on one of the edges, as well as a mesh and cotton carrying pouch. Lastly, it is available in various solid and bold colors, as well as stripes and geometric designs. This would be the best choice for you if you are looking for a large towel to bring along on your camping trip. These microfiber camping towel created by Sinland features just the right size, perfect for use during hiking, camping, travelling, backpacking, and other active sports. These towels are large enough to be used to dry you off after taking a bath. In addition, it is also very lightweight and compact, making it ideal to fit inside your backpack or travel bag. This Sinland camping towel’s drying performance is amazing. 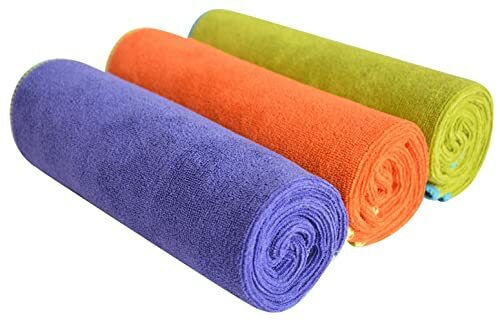 Its texture is soft, super absorbent, and can dry up to three times faster than your regular home towel. It is made of 80/20 blend of polyamide and polyester, making it a high-quality and durable towel. If you are to transport it, this towel can easily be folded or rolled up and would not take so much storage space. If you are looking for a cheap camping towel that does its job as advertised, then you might want to consider choosing this towel created by Sinland. Probably the only camping towel made of natural materials, this product by Green Foster would be one of your best choices. 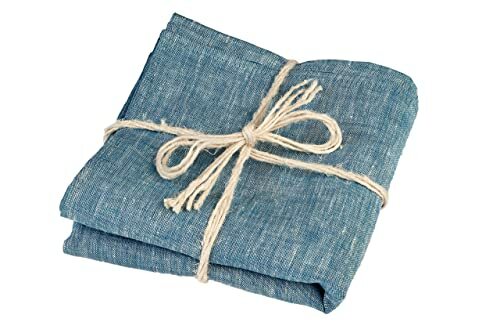 If you are allergic to polyester blends or synthetic fabrics, this camping towel provides a 100% linen construction, which is also hypoallergenic, highly absorbent, quick-drying, and resistant to microbial growth. 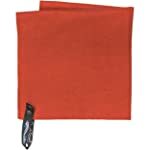 While it may not be able to deliver the same performance as with other synthetic microfiber towels, this camping towel is more lightweight, compact, and quick-drying. A downside that you should be aware of, however, is that it will not be as soft and comfortable as other fabrics, although it may get softer after several uses. If you are looking for a camping towel made of natural materials, then this product by Green Foster would be perfect for you. As the name suggests, this camping towel by PackTowl is built for backpackers, hikers, and campers who pack light. While being lightweight is its best quality, it still can absorb up to four times water. In addition, it is also quick-drying, making it suitable to bring along while camping. Plus, this soft fabric also comes with a hang loop for easy packing and drying. If you are a light packer who wants to bring along a lightweight and compact towel that also has quick-drying and high absorbency qualities, then you might want to consider this camping towel by PackTowl. Before we proceed with the discussions, we first should discuss what makes a camping towel different from your regular towel. A regular towel is generally made of cotton while a camping towel is made of microfiber. With this, regular towels are bulkier and fluffier while camping towels are thinner, more lightweight, and more packable. Another notable difference between the two is that regular towels are meant to be used indoors. It has the capability to dry you off through absorbing the water. This would mean that it would take a long time to dry. Meanwhile, a camping towel is designed to be used outdoors, as it effectively dries you off while drying itself a lot quicker. Lastly, you dry yourself with a regular towel by wiping the water off while with a camping towel, you just do blotting or patting motions. 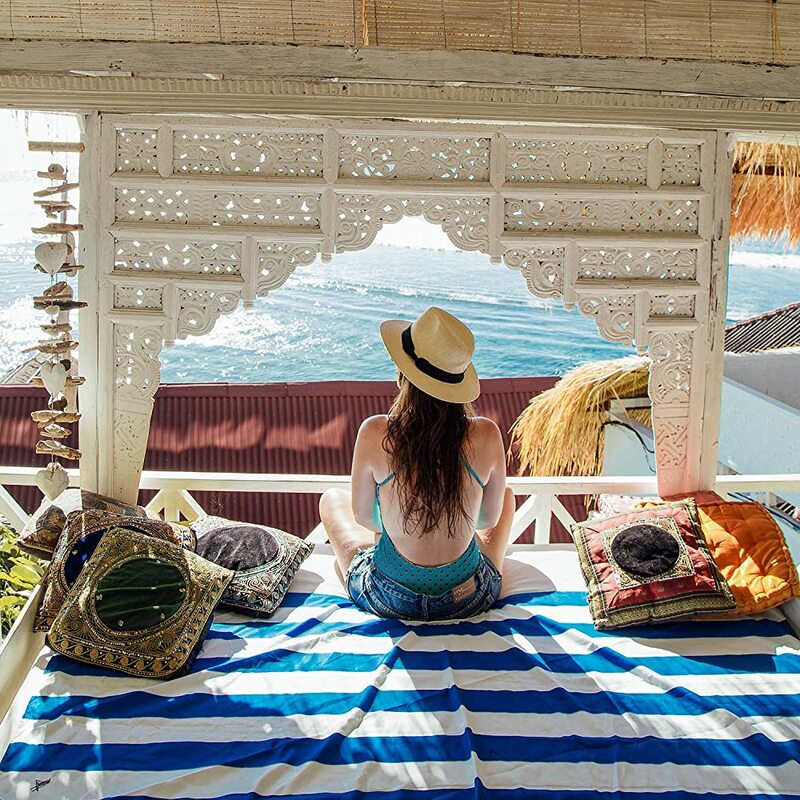 If you love adventures including backpacking, camping, travelling, and hiking, then you are certainly going to need a towel to take with you every time you spend a night away from your home. While it may be a great idea to just bring a regular towel with you, it could take so much space on your backpack because of its bulkiness and its inability to dry quickly. When you go out on an outdoor adventure, you are going to need a packable, lightweight, and quick-drying camping towel that is also very convenient to bring along with you. The best camping towel has all these features, making it an ideal gear to use on your adventures. This is true, especially because you cannot rely on the hostel towels for the rest of your stay, right? Probably the most important factor that you need to consider is the camping towel’s absorbency. To make sure that a towel does its job, you need to carefully evaluate its water absorbency. Determining how well the towel absorbs water gives you an idea of how fast and efficient it will be able to dry you off after taking a bath. Most camping towels are constructed with microfiber, which does a great job when it comes to absorbing water. What makes this material very special is that it holds water in between the fibers. It is also noteworthy that the proper way of using a microfiber towel is that you dab or blot, rather than rubbing or wiping back and forth as you do with a regular towel. Camping might involve a lot of hiking and trekking, making it inevitable that you sweat. With this, you are going to need your towel several times without even getting a proper wash. This would mean that your camping towel is likely to provide you with the ideal conditions where odor-producing bacteria may thrive. To make sure that this will not happen, choose a camping towel that has the capability to dry quickly and has anti-microbial qualities. Some brands utilize silver ions while others use natural anti-microbial materials or treatments. All these features are aimed at preventing the growth of fungi and other odor-producing bacteria while making your towel fresh. If you think about it, the towel is a very intimate item and it is vital that you like how it feels on your skin. After taking a bath, it would be the best thing that you dry yourself with a soft towel. For comfort, some of the best camping towels use plush microfiber, which has a suede-like feel. While they may not be as comfortable as the regular cotton towels, you would get the hang of it after several uses. When you are choosing the best camping towel, it all comes down to the material. In fact, how well a camping towel performs is dependent on the material it is made of. Qualities including its weight, drying capability, absorbency, durability, as well as packability, will all depend on the material. You may either choose between microfiber, cotton, linen, or bamboo. Before buying a camping towel, you must first know how you will be using it. Are you looking for one to dry you off after a bath? Or do you want one for drying the dishes? If you are looking for a towel to dry you off after taking a bath, then you are going to need a larger camping towel. However, a small towel would be sufficient for drying the dishes, your hand, or cleaning spills. A camping towel should be very easy and convenient to transport. In fact, its packability is greatly dependent on its size, as well as the material it is made of. When choosing the best camping towel, go for one that is made of synthetic materials because they weigh a lot less and they pack a lot smaller than your regular home towels. A camping towel you should choose must be quick-drying. After all, you would not want to be carrying a wet and soggy towel as you trek or hike, right? It would just drag you down and the dampness might just be the cause of mildew, bacteria, bad odor, as well as mold. It would also be very unhygienic to pack a wet towel together with the rest of your things in your backpack. Now that we have reached the end of this post, we hope that you have at least narrowed down your choices into choosing only the best product for you. 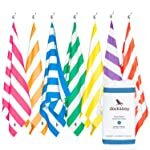 We have done the hard work for you and have provided you with the best camping towels, so all you need to do now is to carefully evaluate which of these camping towels offers you the benefits you need and deserve. That way, you get to choose one that gives you great value for your money.